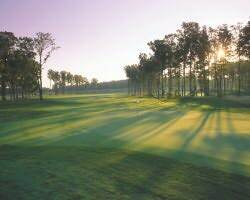 Treetops Resort – Traditions Course | GolfTrip.com - Golf Tips, Vacations, Packages, Destinations and more! The Treetops Resort in Gaylord, Michigan, aside from its reputation of ranking amongst the best golf vacation destinations in America, has a reputation for being aptly named. Its courses speak for themselves – the Masterpiece, the Premier, the Signature. They are as much a masterpiece, a premier, and yes, more literally, a signature course respectively. The Traditions Course is no different. Designer Rick Smith indeed has brought the game a little further back to history with his work on the Traditions Course. The course features a links-style layout complete with wooded pins and pennant flags. It has a slightly rolling hill terrain but is very suitable for walking and the greens are smaller and are actually less undulating that its sibling courses in the resort. The uphill shots add a little more flavor to the game. From the longest tees, this golf vacation favorite measures 6, 467 yards and plays for a par of 70. At the Traditions Course, the golfers will be allowed to choose whether to play on full 18 or just play a 9-hole game. The front nine goes back to the starter house, giving golfers the freedom to end their round right there, or move on to a more challenging game towards the 18th. The features here are virtually the same with those in its sibling courses, only more forgiving. Rolling terrain, wooded areas, undulating greens – almost the same but not quite; but equally challenging, fun and memorable no less. The course not only brings a traditional flair in its features; it brings back the good ol’ happy days of golf trips of yesteryears.